Just a bit of silliness to send to a friend, just because I can! I used stamps from the 12 Days set and the 12 Days Companion Greetings by Julie Ebersol! I extended the phone cord across the card because when I was a kid, a very few short years ago, I was always getting in trouble for stretching it and tangling it into knots! I am so grateful to the genius that invented wireless phones! A few SHORT years ago???????!!!!! Love your card Tammy! That's cute to extend the cord and yes, I remember doing the same thing! I was probably trying to get around the corner with the phone so my parents wouldn't be listening in on my conversation. I do love silliness...everyday.. Fabulous fun card Tammy. Oh Tammy, that's just adorable! This is such a fun layout too!! I love your fun and cute card Tammy. I remember that long stretchy cord! We were a one phone house, but the receiver would reach every single room! 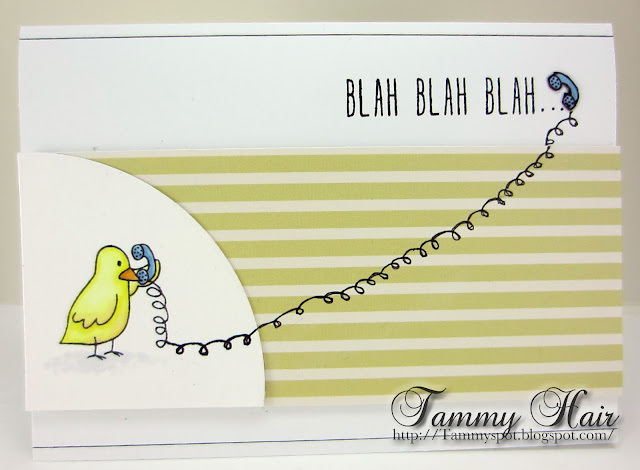 What a fun card, Tammy! Again, I get a grin! How funny and CUTE! Too cute! What fun. I hope your friend loved it!